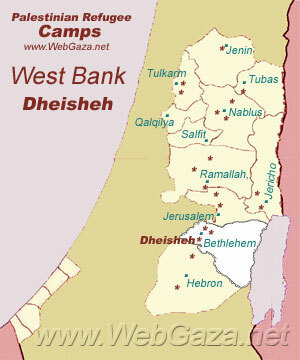 Dheisheh Refugee Camp - Where is Dheisheh Camp Located? The camp’s original refugees came from 45 villages in the western Jerusalem and western Hebron areas. Like other West Bank camps, Dheisheh was established on land UNRWA leased from the government of Jordan. Where is Dheisheh Camp Located? Dheisheh camp was established in 1949, it is located within the municipal boundaries of Bethlehem on 0.31 square kilometres. While all shelters are connected to public water and electricity infrastructure, 15 per cent of the shelters are not connected to the public sewerage system, instead using latrines connected to percolation pits. A third of people are unemployed, with job opportunities restricted by the inaccessibility of the Israeli labour market. Unemployed people often open small businesses, such as roadside stands. The camp was heavily affected by the second intifada.